Being wise doesn’t mean you know everything. Owl knows his oats about many things, but he gets it wrong sometimes too. For instance, he’s not that much of a speller. Kids can learn the value of a well-rounded education from Owl’s example. Even smart people need to rely on others. No one is right all the time, or has all the answers. Owl needs his friends to help him and point out errors on occasion, just like everyone else. This is an important lesson in teamwork and support. Teachers are an essential part of our education. As wise statesman of Hundred Acre Wood, Owl represents a teacher in many ways, always offering explanations and observation. Kids can discover the importance of having such people in their lives who can instruct them. Advice isn’t always welcome. Sometimes people share their opinions with you even when you don’t want them to. Here, a child can learn how to know when to get involved, and when to leave someone alone, and how to communicate this to others as well. Strong family ties provide firm roots. Owl loves sharing stories about his relatives. His strong sense of family heritage and obvious love of his kin help mold who he is. Kids can learn about their own families, and thereby discover more about their own roots. Spelling is essential to good communication. We mentioned that Owl doesn’t get high marks for his spelling, though he does compensate for it in other areas. Still, kids can learn that the ability to spell is very important. Reading comprehension is important too. Owl’s less-than-stellar reading ability leads him to misinterpret a note left by Christopher Robin. He believes Christopher has been abducted by a dreaded creature called the “Backson”, when the note really said that Chris would be “back soon”. When speaking, it helps to make your point clearly. 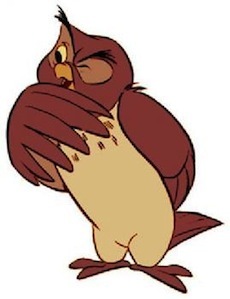 Owl tends to ramble at times, and loses his listeners who quickly tire of his long, drawn-out tales. Kids can learn that they will be better understood and can expect better results when they speak clearly and concisely. There’s a time for words, and there’s a time for action. Owl has trouble with this point too, on occasion. He once almost got Piglet and himself swept over a waterfall by launching into a rather ill-timed bit of story-telling. A good friend is a good listener. Offering advice to a friend is good and kind thing to do; but it’s equally important to be a good listener, perhaps more so. We can’t help someone if we don’t listen carefully to what they have to share; and many times, all that someone wants is a sympathetic ear.